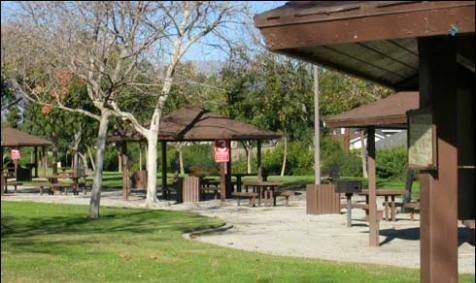 Picnic benches at Westwind Park create a place for celebration opportunities and for relaxation. Parks and recreational spaces represent a critical physical, social and psychological element of a complete community. Beyond merely providing recreational opportunities, carefully sited and well designed parks serve a multitude of functions for the community: creating neighborhood identity, serving as focal points for gathering (the “third place” concept) and celebration, and increasing and protecting environmental resources. Moreover, parks act as the city’s “breathing spaces,” where people experience relief as they go about their daily routines. Establishes goals for the Ontario park system and recreation programs. Underscores the vital role parks and recreation programs play in economic development, land use, housing, community health, infrastructure and transportation goals. Parks promote community engagement, economic investment and quality aesthetic design. Parks should be distributed throughout the City. Well planned, managed and maintained parks provide opportunities for physical exercise and relaxation, which can lead to better health of members of the community. Programs and activities enrich the lives of members of the community.